B2B PPC Marketing companies often find themselves so distant with the hard work of running PPC marketing campaigns, supervising agencies and sales force, and attending to the day-to-day activities that they lose sight of the Pay Per Click campaign goal. However, it is vital every occasionally to step back, get a little perspective, and appoint in some tactical strategic PPC marketing plans. PPC strategic planning looks ahead of the instant status, in the process illuminating where you want to go in the future with your online marketing objectives. This strategic pay per click outlook can be contrasted to the planned level that looks at PPC metrics performance of detailed services/products or online target markets over a shorter time and equipped planning which spotlights on the fundamentals of getting the ROI. Going after a boarder PPC goal is a rather oversimplified but optimistically functional outline of the PPC strategic planning process. Recently we had a question from a user who was interested to learn how to optimize their current pay per click campaign. 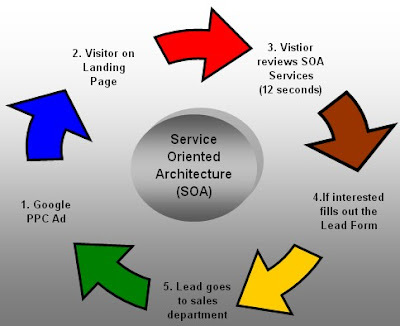 The service they offer is quite complex which consisted on Service-oriented architecture (SOA). The company’s challenge was the budget and bidding strategy approach. First thing you have to know is that Service Oriented Architecture (SOA) obviously falls on the B2B PPC category, so the budget and PPC bidding strategy needs a thorough approach. So, our first suggestion was to “Day-part” as we have mentioned many times before, so you are limiting your budget to days that users are specifically looking for you. Secondly, we recommended to bid only on the keywords that are highly relevant to their service which in this case is Service-oriented architecture (SOA). Of course there is more to it but that’s the surface of that. Once we made these changes we did a benchmark study to measure the success of our B2B bid and budget management strategy. The results were quite astonishing as the lead volume increased by 67% in a matter of three weeks and the lead quality was up by 47%. As we had presumed the action plan worked like a charm despite their challenge. It is very interesting to see how few little tweaks can make a big difference in a Pay Per Click campaigns success. 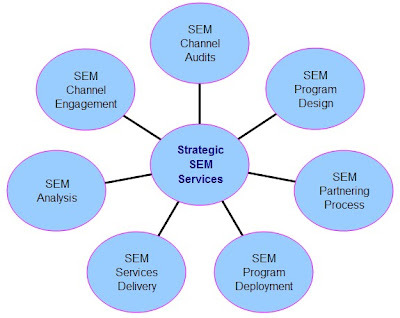 However, we did a lot of research on the subject of Service-oriented architecture (SOA) to learn more about their business and market segments prior to suggesting the strategy as it is a very complex industry. Most B2B companies when are about to launch a PPC campaign tend to be confused or rather puzzled where to spend most or their budget Yahoo or Google. Let me explain the differences between these two search engines in terms of B2B spending. Yahoo is a very B2C consumer based search engine and most of the people using Yahoo are usually looking for products that can buy directly from the website. Yahoo is great for day to day product such e-commerce online stores or websites that sell affordable products to the average consumer. So in other words yahoo is not known to have high conversion rates when it comes to B2B companies. Google on the other hand is more focused on hi-tech industries and B2B services. It is more lead generation based search engine than Yahoo where consumers are more educated about the web searches than Yahoo moms&pops users. So if your company falls into the B2B category my suggestion would be to start thinking about dropping more funds onto Google Adwords than Yahoo search marketing. Speaking from experience I have seen conversion rates 80% higher in Google when it comes to B2B software companies. However, it may vary for some B2B companies as the products and services are not the same so do not go right ahead and start pouring all of your fund into Google. Do your research and see what your competitors are doing, whether they are in yahoo at all and if they are what type of keywords are they bidding on in one engine vs the other. Well this if all for now as you know you will have to contact me for more info. Day-parting is a crucial part of you PPC campaign as it controls your spending levels throughout the day and week. For most B2B companies it is a must to implement a day-parting strategy as it will help the daily budget get spread out evenly and get the most of the PPC campaign. So how do you go about finding the best day-parting ? Start by putting yourself in your clients or customers shoes and think about the times they might be searching for your product or service. One example would be for Software as Service (SaaS) companies whose major target markets are other small or large business. For maximum results I would go ahead and day-parting only five days a week (Mon-Fri) during office hours from 9AM-8PM. So you may ask why this? Well think about it if you were a business to business senior decision maker; what times of the day would you be searching for a Software as Service (SaaS)? This is just a surface of day-parting and there is a lot more to it than what is just described above. Feel free to contact me for more info on this article. Google Adwords is without doubt one of the most effective marketing instruments which in recent years has revolutionized the way we do online marketing and this has made Google the most important and rich search engine in the world. What is the secret of Google Adwords? Why it works so well? The reason is very simple: it is the meeting point par excellence of supply and demand of any product / service in the world. And 'therefore can offer its product to those who, at the same time where it is seeking, it is actually interested! Payment of advertising is done for each contact procured (for each click the ad - CPC). When advertising on Google Adwords is useless? When websites are created without a clear objective of converting visitors (potential customers) into buyers , well there is no point of having that website in the first place. So, even optimizing the best advertising investment, obtain a large number visits with no real return (ROI). What should we do to get a good return on my advertising investment? Maximizing the investment in advertising adwords using the best techniques and strategies. Achieving a single site or landing page that they are able to attract visitors (procured via adwords) to take the action you want (purchase, subscription newsletter, survey. It happens almost every day that I contacted by clients that identify Pay Per Click or Internet Marketing (and who is dealing) with the gain-line. A friend of mine asked me to give him a hand for a PPC project and told me she was contacted by several "web marketers" whose proposals were not ever make money over the end in itself and I asked if it was the same for me. I am disgusted. Here, precisely on this point I'd like to clear up by false interpretation of Pay Per Click once and for all. The objective of Pay Per Click is Offer Value to your customers. The money came as a natural consequence of value. NOT gain exists online and offline worthless! Question right, I thing I have to offer? What is the value of my offer? What I have to DARE? Wrong Question: How do I earn? For what reason should someone pay if they do not receive in return something of equal value? You do? The examples of successful online are examples of those who have been able to offer real value and certainly not speaking of famous chains! So those who have nothing to offer can not expect to win. The first tool that you must obtain in order to do business online is a range of value something that represents real value for someone. The promises have little effect when customers realize that what you sell is worth much less than we have been persuaded to believe. In concluding that the specific Pay Per Click is not just pure business, but goes far beyond. For example, the Pay Per Click tool used by associations, non-profit, humanitarian organizations, research organizations to do good and increase their awareness. I offer Pay Per Click freelancing services to busy and growing companies or small business in need of a PPC freelancer. I understand the need business have these days for a PPC freelancer who do not have the time or the funds to hire an agency or in house PPC person. Conduct competitive analysis and keyword research. Why spend with pay per click advertising ? When it comes to creating effective pay per click campaigns or Keyword niche focused ppc campaigns as referred to the promotion through ads pay. Ads are propagated in the national network of search engines, but often you need a promotion different sites located in some way. If a company does not sell online is hardly an effective pay-per-click campaign that goes across the national network of Google, for example. So have the strategy of "wired" on their business goals is crucial. Often times I get questions about PPC bid management techniques and strategies and how to implement them on a pay per click campaign. Well, that’s the million dollar question and answer that no one likes to share since it may jeopardize a clients competitive success strategy. However, there are a few tips out there that might help anyone who is in a need of some valuable advice to execute in their current PPC campaign. 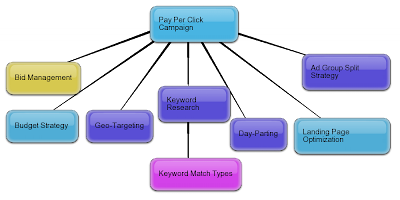 But before I reveal some of these PPC management strategies I would first like to point out that keyword bidding is only one part of the puzzle of a pay per click campaign management. Before you even begin to think of a bidding strategy you have to think of your campaign daily and monthly budget strategy because that’s what controls the bid management limitations. For example: if you have a daily budget of $200 for twelve campaigns each with 100 keywords it is going to be very difficult to spread it out within these campaigns. And believe it or not that’s a mistake many PPC managers do on daily basis without even realizing it because they are way too focused on implementing their own PPC bidding strategies but are not looking at the big picture. While it is essential to understand how bid management works, it is also important to understand the prioritization of the Pay Per Click process from the beginning to the end of the funnel. Ensuring you have the right budget in mind to support the keywords you intend to bid on so your daily budget doesn’t get maxed out in two hours. So prior to launching a PPC campaign think about what your end goal is and how much are you willing to stretch your advertising budget. PPC advertising can be complicated and risky if you “throw it at the wall and see if it sticks “. The days when Google used to charge 0.5 cents a click are gone and so are those PPC strategies. Now of course these are common sense strategies to some you, but imperative to your Pay Per Click campaign success and if executed strategically conversion rates will skyrocket.Every business is unique in its own way so it may take some time to start building that great click through rate which greatly affects the bidding war. My best advice to those business owners or corporations who are running their in-house PPC campaigns is to take a deeper look at what their bidding strategies are focused on and revisit. In SEM advertising there are many courses offered that teach how to run an AdWords campaign to study the keyword research in order to have successful PPC campaign. So people often ask me what is better to learn first SEO or PPC? In a nutshell, the two methods are equally important. The first, aimed to have traffic data provides for the purchase of many keys, the implementation of a number of landing (usually for small groups of key theme specific), the inclusion of a system for tracking Google Analytics) and coverage of two months (possibly not in August or Christmas). Usually such a campaign, if well optimized, gives much guidance without excessive expenditure. The second system is designed to provide information on the conversion rate of keys. The differences compared to the first landing are primarily in, that number should be higher, much more carefully, with professional graphics and inspiring confidence. Even the announcement is made with a different style than the first. The landing must have an action that we can draw in order to give the conversion rate for each key. Last difference, sometimes two months are not enough to have sufficient data to a statistical analysis seriously. The first objection is that I do in the courses, from people who participate, is: "But with this system we have to spend the money at the expense of the budget fixed for position." Of course, is exactly that, but what are the alternatives? Here are some: assess the traffic using the tool of the engines, click the keys on the basis of who has the industry, if there has already worked at least two or three times to go nose; groped to imagine what could type who was interested in the issue, think about what you do and believe that others would do the same. In reality, all those who have tried know how false these systems, from whatever you have. Every now and we gillnets, but give a reasonable indication to a client, follow these methods, it is really risky. Incidentally, this is why many prefer to ask the SEO score keys, so the responsibility is his. Compassion, because the study of the keys you learn a lot in many areas, the analysis is cheaper than you could imagine, the signs are good. Obviously because analysis is serious (sure there is no doubt in our sector) should be able to manage the campaigns. In particular we need to know how to write ads recitals and psychological aspects of marketing, we must be able to optimize the economic aspects (Quality Score, relevance, CTR), the landing should be well done (in terms of communication and Usability). As I think, just the ability to make a good analysis of the keys is one of the strengths of a high-level SEO and even more of a Supervisor or Web Marketing Consultant. The problem is that it takes away from a budget placement, but that the analysis of the keys should have a separate budget and even be sold as a service to himself (incidentally, just so often and make the sale). Indeed, it is said that the same person who studies the keys, then must deal with the positioning of the site. Looks like Google changes to the algorithms for calculating the Quality Score, used by the AdWords system to determine prices and positions of ads on their advertising platform will really help advertisers improve their campaigns performance. Google says that the calculation of the Quality Score will be in real time based on queries made by users. Besides this will also be taken into account all other factors such as the historical clickthrough rate(CTR) on the ads with your account and the quality of landing page, although the latter factor is what will be considered less frequently. Google also has replaced the concept of minimum bid for the ad with the estimated price to appear on the front page. What does this mean? Certainly for keywords that have few advertisers that change in pricing policy will not lead to great revolutions. For all those advertisers who want to appear on the front page for searches on a keyword particularly competitive on price will probably be higher than before. Acquiring strategic techniques in order to better promote their goods and services; understand the logic of pay per click marketing and to learn from all those means not only the implementation of a good business but also to achieve important social goals.Pay per click marketing experts learn news techniques of promotion everyday, communication, marketing and sales of products and services, to guide aspiring entrepreneurs through this important journey, in social line of work and a proper approach to the whole world of the company. From direct marketing to pay per click marketing building a network of contacts, through sales activities and elements that make up the Customer Care, with particular attention to the needs and problems of the disadvantaged. Based on this emarketers report we can clearly see where B2B is heading in the next three years as far as spending goes on advertising budget. Where are marketers spending their money? What media influences decision-makers most? What are employees really doing online at work? What I like about these stats is that most of the B2b companies currently are scaling back on PPC spending as economy has greatly impacted many companies marketing plans and budgets in order to meet their other business demands. As far as I am concerned B2B companies will be more likely to spend on pay per click advertising despite the fact of this economy downturn given that for most of them online marketing is the only way to generate leads. For example softwre companies are the number ones on the list along with other hi-tech ones. I think there is definalty potential for B2B companies to profit from PPC. As pay per click marketing becomes more competitive by the day, it is necessary to have a set of PPC bid management tactics in order to outbid the competitor’s bid rivalry. One of the common bid strategies I use is to bid on competitor’s names so whenever a user searches for your competitor your PPC ads show up on googe or yahoo whatever search engine you are running your PPC campaigns. The idea behind these PPC bid management tactics is to somehow increase you brand awerness because everyone know about large corporation but are unaware of smaller organizations who may offer the same services or products at a lower price and sometimes even a better quality. So find who all you PPC competitors are for certain products or services and its up to you who would you like to bid on. So how do you find who your rivalry is ? Try searching for a service keyword on Google and look at the ads that show up for those specific keywords, that is how you know who the other players are. Another one of my PPC bid management tactics is to keep you daily budget higher than what would you normally have it set everyday. This is done to receive higher impression because Google will see that your daily budget is high and it will spread out your money throughout the day so even if you don’t spend it all (which you wont) it will give you the opportunity to set lower bids during the peak time of the day because the competition will usually and in most cases bid very aggressively in that time period. Bid wisely and tactfully on your core business terms as those tend to be the ones that waste most of your budget during the day. I would recommend this PPC bid management tactic to be implemented only for keywords that your business is all about not for non-relevant terms that do not bring in any revenue. Choose 5 – 10 terms that you would like to optimize and then play around with the bids until you find that right daily balance and save your hard earned money.